Happy St. Patrick’s Day! Give me a moment to explain the statement I made on this title. On this day, I often revisit the fact that my father’s side of the family is Scottish. I often hear on this day, many people speaking of their “Scotch-Irish” ethnicity. So I looked into this “ethnic” group and have learned that it is more of an Americanism than any term that anyone in Ireland, Scotland, or England would be familiar with. But I’m not here to make a case against Scotch-Irish being an ethnicity or not. I wanted to share the story of the Skeens side of my family, which I have partially known, but came to know more intimately this past year. The story of my people goes way back to the first century AD, known by the Romans as the “Picts,” Latin for piccolos which meant “painted.” They were indigenous tribesmen who painted their bodies and were fierce warriors. Emperor Hadrian feared them so he built a huge wall to keep them from invading the newly found Britannia (parts of Hadrian’s Wall is still standing on the border of Scotland. By the 5th century Celtic immigrants (who were also called Scots) had come to that region. They were mostly Christians (I wonder if St. Patrick ever made it over to Scotland). In the 6th century the king of the Picts was converted to Christianity. In the 10th century the land that the Picts lived on was claimed as Scotland by the king of the Scots who had merged the Scots and the Picts kingdom in the previous century. 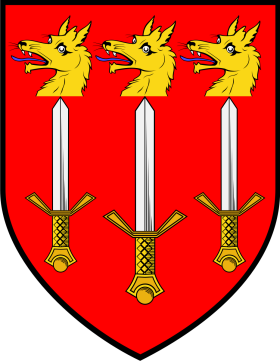 The traditional origin of my family name is found in a late 11th century legend. It’s a story about a young man from the Robertson family in Scotland. One of the younger sons of Robertson of Struan was one of King Malcolm’s servants, and was living in the house of Duncan at the time. It’s been said that he went by the name James Duncan. He saved the life of King Malcolm II by protecting him from a pack of wolves with only a small dagger or ‘sgian dubh’ (skene doo) knife. The king rewarded this young man for this heroic, life-saving deed by giving his family a large parcel of land near Aberdeenshire, and called him the lord of Sgian (known to us as Skene). The family eventually took their name from the ownership of their land. This story is commemorated in the shield of the Skene chief, which displays three wolves’ heads impaled on daggers or ‘durks.’ Now that’s what I’m talking about! Now I’ll fast forward to the 18th and 19th centuries. The ruggedness of the Scottish land led to the separation of the the Scottish people, from the Lowlanders to the Highlanders. Highlanders were the clansmen. The clan was the way in which you identified who you were, where you came from, how you live, and what you do for a living. “If you were exiled, thrown out, or somehow detached from your clan, you would be called a ‘broken person.’ Broken people are people without community, which is really a death sentence to clans people.” (An Other Kingdom, 30). This division was marked by racism. The Lowlanders viewed the Highlanders as archaic, barbaric, and savage. You could tell apart the two people groups predominantly by their clothing and/or language (ancient Gaelic). During this era, the Highland Clearances were created. This was an attempt of the English royalty to wipe out the Highlanders; their lives, their culture, and their homes/land. Not only did the Highlanders almost entirely get wiped out, but their settlement patterns, their style and pattern of living has almost no trace to this day, with only remnants of how their civilization lived in a small museum in Scotland. The Highlanders became such a despised group, that they were not even seen as full humans to most Lowlanders and Englishmen. The Highlanders in return looked at the Lowlanders as traders and half breeds, who mixed their race with the English. This greatly affected my people, and many of them viewed themselves as broken people without their clan. The systemic racism against them has in part, contributed to the angry history our people have, and their hatred for English establishment, or the like. From this point on, the surviving Highlanders mainly migrated to the Americas, Canada (Nova Scotia), New Zealand, and Australia. Those who were a part of the Skene clan landed in the Carolina’s and made their homes in the Appalachian mountain range, as it was very similar to their lost land in Scotland. Most left their country as indentured slaves, or poor beggars. This story, my family heritage, is part of the beginnings of the “Hillbilly” culture. Yes, I am a hillbilly. My family name changed many forms once they left Scotland. It can be read as Skene, Skean, Skeen, and Skeens (the “s” was added in the 20th century because it sounded better). So as a Scottish Highlander, I wanted to say thank you to the Celts, in spite of all the years of hardship. It was the movement of God’s people in the 5th century that has allowed Jesus’ name to be known among my people.